A commonly asked question from guests planning on visiting us in Desolation Sound concerns wildlife: What will we see and when is the best time to see it?! Whales and dolphins are some of the most asked about wildlife, and for good reason! These charismatic marine mammals have fascinated and excited us all for thousands of years. In Desolation Sound we commonly see several types of whale and dolphin, from orcas and humpbacks down to harbour porpoises. While Desolation Sound is more known for its warm temperatures and striking mountain scenery than its concentration of whale sightings compared to the Johnstone Strait, the increasing number of sightings in recent years has been fantastic to see for our guests and guides alike! Following is a brief description of each species and their migration patters through Desolation Sound. Orcas are fascinating, well-loved, and occasionally feared apex predators that have a well-earned reputation for both astounding intelligence and devastating hunting methods. On the inside of Vancouver Island in British Columbia there are two commonly seen sub species of orca – the resident ‘fish eaters’ and the transient ‘mammal eaters’. In Desolation Sound, we are far more likely to encounter the transient variety, named for their seemingly range-less movement up and down the coast in search of their preferred prey: the harbour seal. They will also prey on sea lions, dolphins and porpoises; but don’t worry, despite heir ‘mammal eating’ reputation, there has never been a recorded attack on a human by a transient orca in the wild! Transients travel in groups of 4-6 individuals, while residents are usually seen in much larger family pods. They are slightly larger than residents and tend to have a dorsal fin with a more pointed tip. 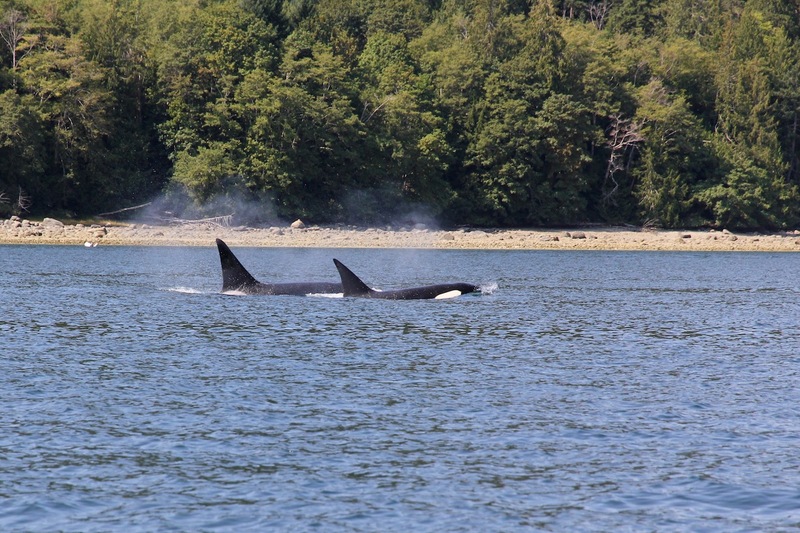 We can see transient orca in Desolation Sound at any time of year as they roam through the area in search of prey. We will often have multiple sightings of a group over a 4 or 5 day period, and then a period of no sightings for a while before the pod – or another pod entirely – returns briefly again. After being fished out of the waters inside Vancouver Island early lat century, humpbacks have made a stunning return to Desolation Sound and the Strait of Georgia in recent years! The typical migratory pattern of humpbacks is to head south for the winter to warmer climates to breed, and then return in the summer to feed in our nutrient rich waters. Anecdotally, we start to see more humpbacks in June in this area, and the numbers increase steadily and peak in late August and September, before the huge mammals begin their migration south en masse. That said, a small population does tend to remain year round in the Strait of Georgia. The are also noted to be arriving earlier in numbers and leaving later, most likely due to the abundance of food! Adult humpbacks range in length from 12-16m and weigh 25-30 tons! They have a black body with a stubby dorsal fin, and are usually seen solo or in small groups of 2 or 3. They will usually surface 5-10 times before raising their flukes and diving for up to 20 minutes. However, lucky guests have spotted these huge mammals breaching and throwing their entire body out of the water at one time. Despite this, biologists are still not quite sure why whales exhibit this exciting behaviour! Pacific White Sided Dolphins are usually spotted in pods of up to 50 members, but sometimes they are seen in larger pods of several hundred dolphins or more! They can be easily identified by white and grey markings underneath and at the tip of their dorsal fin. They are much larger than porpoises, and they often exhibit flamboyant behaviour such as constant breaching and surfing in the wake of ferries and power boats. Dolphins spend most of their time on the inside of Vancouver Island in the passageways north of Desolation Sound – the Discover Islands, mainland fjords, and into Johnstone Strait. However a couple of times a year there are sightings of large dolphin pods in the Sound and even in Okeover and Malaspina Inlet. Our 5 and 7 day Expedition Tours have a greater chance of sighting dolphins as they head further into these passageways and mountains fjords. Two kinds of porpoise can be spotted in Desolation Sound – the Harbour Porpoise and Dall’s Porpoise – and for the layman it can be hard to tell them apart. The Dall’s Porpoise shows a white dash on the dorsal fin, and is slightly larger than the Harbour Porpoise. Porpoises can be seen year round and tend to be seen in small pods of 2-5 ‘porpoising’ along at the surface. They rarely – if ever – breach or play, and are far less gregarious than their larger dolphin cousins. 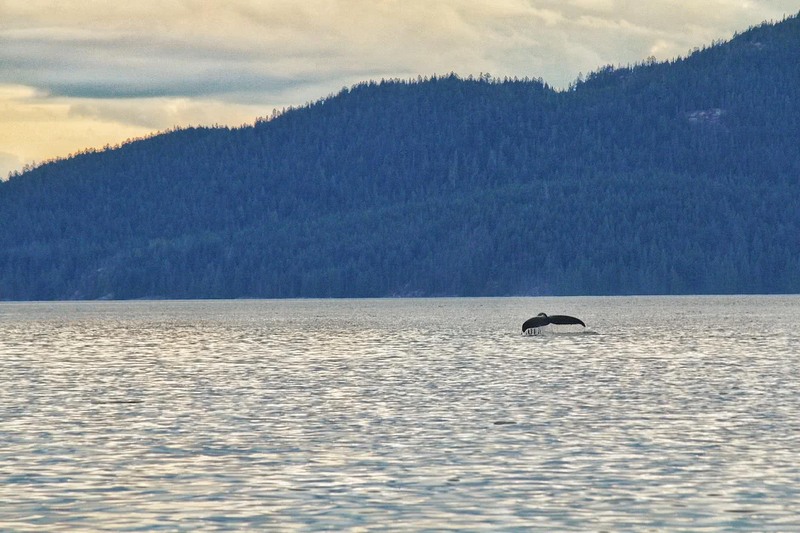 For more information on whales, dolphins, porpoises and all other wildlife in Desolation Sound, please check out our Wildlife Page on this website! 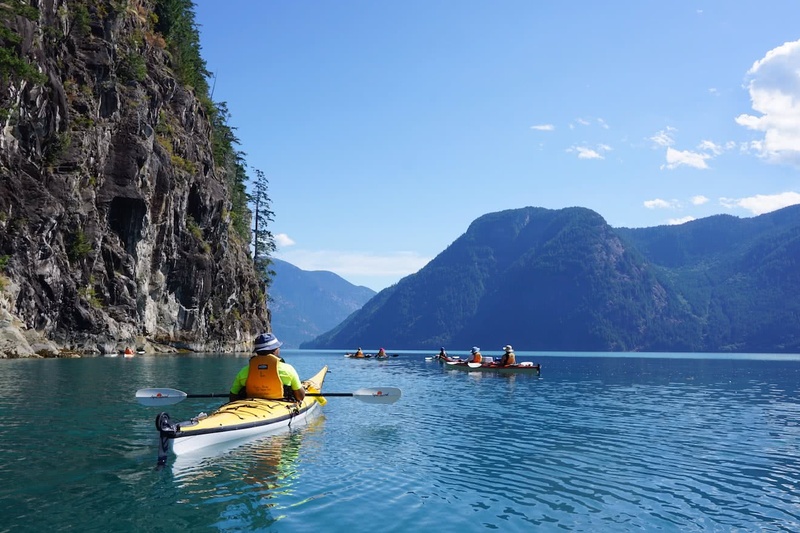 Desolation Sound is renowned as a premier sea kayak destination on the British Columbia coast, but few people know that there are a number of great hikes – only accessible by boat in Desolation Sound – that are perfect to break up the paddling. These Desolation Sound hikes have differing features and difficulties, from forested strolls to freshwater lakes, to uphill slogs to breathtaking vistas. Below are three of our favourites, all easily accessible for kayakers on a Desolation Sound adventure! 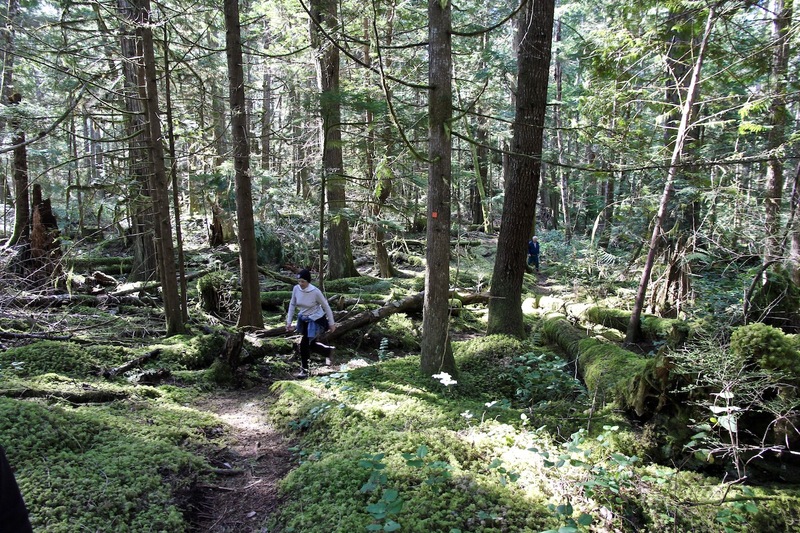 The Sunshine Coast Trail is gaining in notoriety among hikers in British Columbia, with 180km of trail and 14 backcountry huts along it’s route. 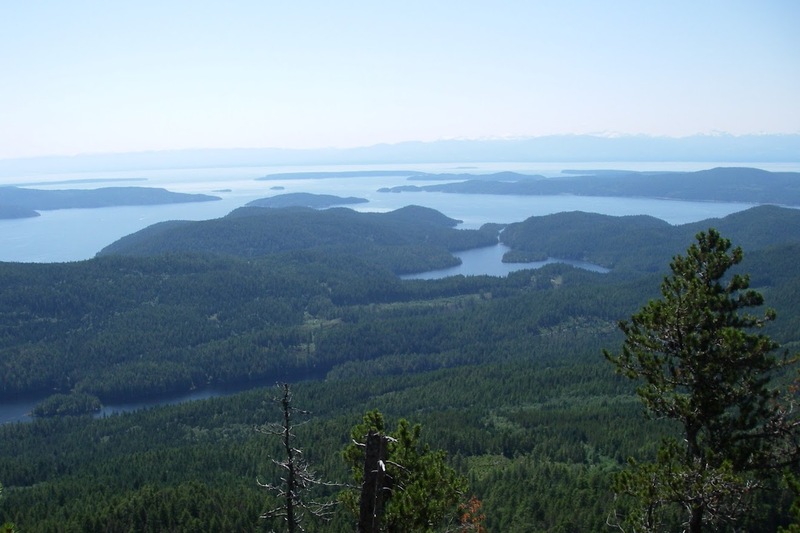 Few people are aware however that the trail starts at Sarah Point, in the SW corner of Desolation Sound, and can be used for a number of distinct day hikes while you are visiting! The easiest place to access this trail is at Feather Cove, which is at the tip of Malaspina Peninsula close to the entrance to Okeover and Malaspina Inlets. From the easy landing on the beach the trail heads off in two directions – west to a beautiful viewpoint over Desolation Sound (and eventually the trailhead at Sarah Point), and south through sections of old growth cedar and Douglas fir to a number of freshwater lakes that are perfect to jump into on a long, hot summer day. A rarely travelled trail – by kayakers at least – is the climb to the peak of Llanover Mountain that is accessed by an easily accessed trailhead in Roscoe Bay. The trail is mostly uphill, easy to follow, and takes from 1.5-2 hours one way. The views from the top, however, are spectacular! From the viewpoint at the end of the trail you can see right back west over Desolation Sound, the Strait of Georgia, Cortes and Quadra Islands, and the peaks of Vancouver Island way in the distance. Head there early in the morning to beat the heat, and then paddle over the Black Lake at the head of Roscoe Bay afterwards for a well earned swim in a beautiful freshwater lake before paddling home. 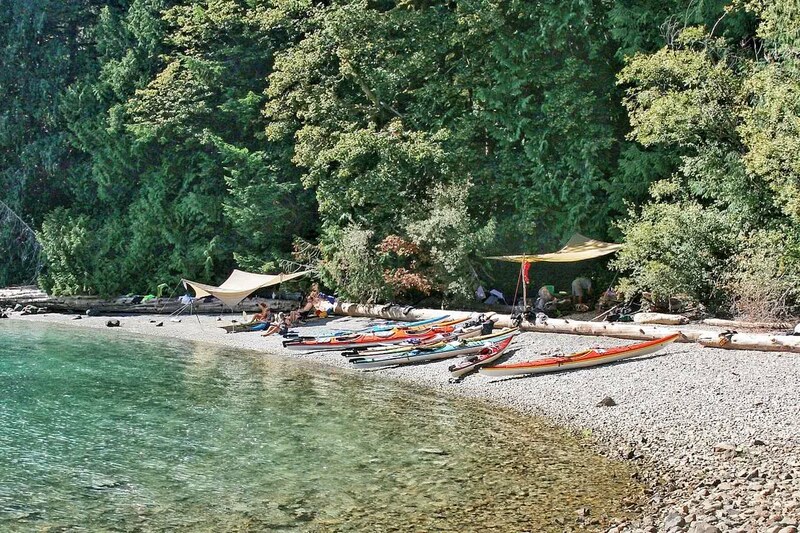 With its location in Tenedos Bay – an easy hour’s long paddle from the Curme Islands – Unwin Lake is a very popular day trip for kayakers base camping in Desolation Sound. 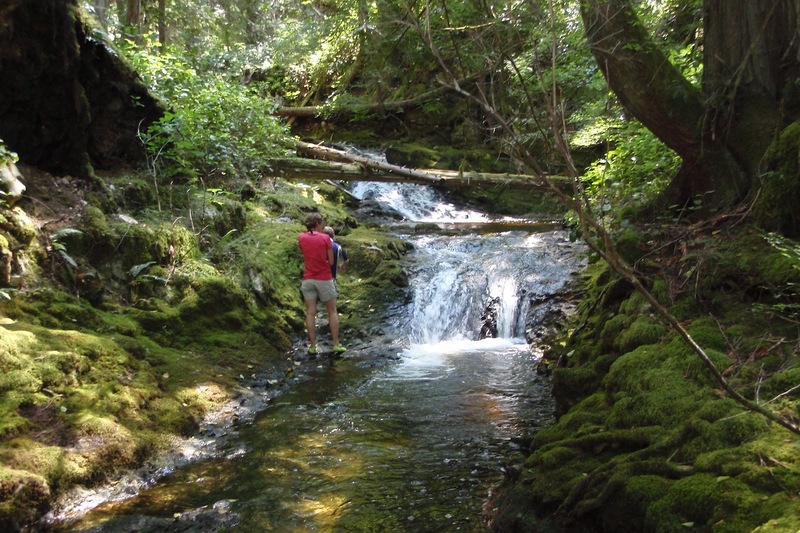 The easy trail from the campsite runs straight and wide through a beautiful, mossy forest. Occasional side-tracks veer off from the main trail and visit the creek leading to the bay. After about 15 minutes the trail meets Unwin Lake, and you can follow it clockwise around the lake and choose a private nook that speaks to you for lunch and a swim in the warm fresh water. The trail continues further, past great spots for cliff jumping and further away from other visitors. Returning to your kayaks the way you came, another 45 minutes is all it takes to return to your base camp on the Curme Islands. 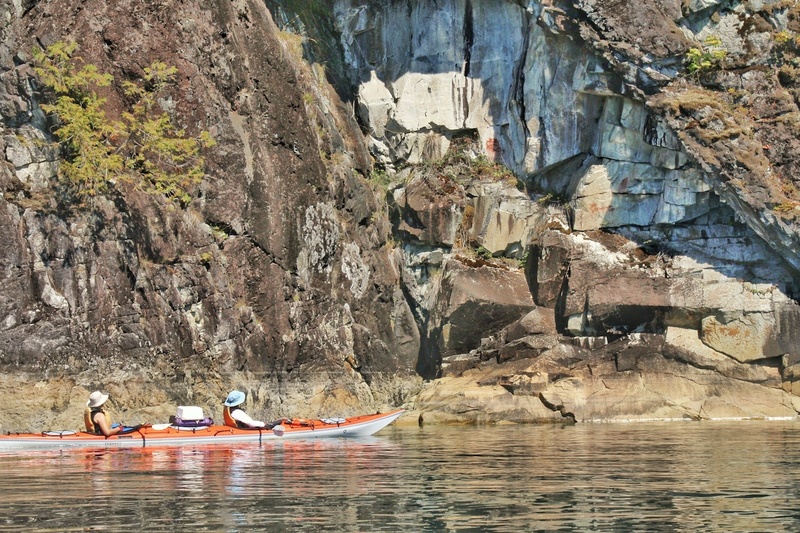 2019 will be the 25th year that Powell River Sea Kayak has been running kayak tours, offering kayak rentals and lessons, and recently added eco resort packages at Cabana Desolation Eco Resort into Desolation Sound, British Columbia. Over that time we have cultivated a reputation of quality, safety and local knowledge that has made us the Desolation Sound kayak company. Why Desolation Sound? What makes this place so special to us, so much so that we have dedicated one quarter of a century introducing it to thousands and thousands of guests from all over the world? Desolation Sound, Okeover Inlet, and the village of Lund are often referred to as ‘the end of the road’ on the mainland coast of British Columbia. At the terminus for Highway 101 north from Vancouver, it is indeed a remote and adventurous place! Deep inlets and immense mountains cut off any potential settlements or road access beyond the Sound, and the further you paddle towards and into the Coast Mountains the easier it is to lose yourself in the scenery and disconnect from the urban world left behind. However, remote doesn’t necessarily mean difficult to access. 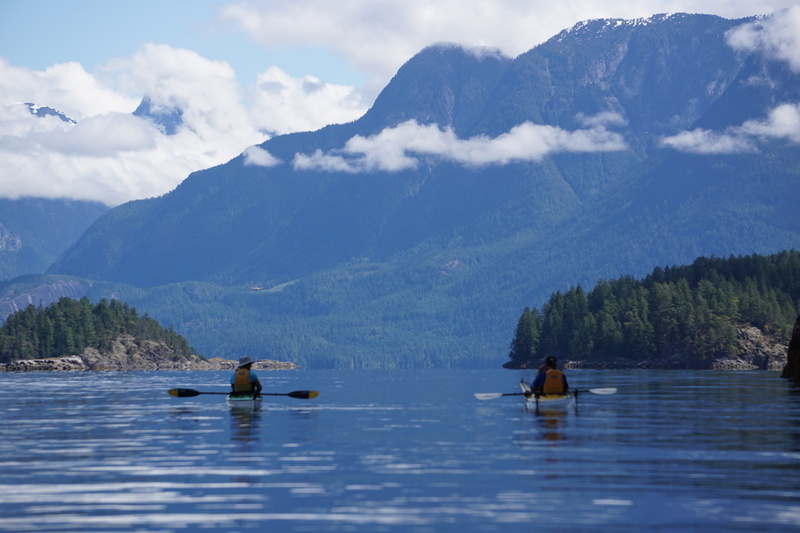 Compared to other premier kayaking locations on the BC coast – from northern Vancouver Island to the Central Coast to Haida Gwaii – Desolation Sound is surprisingly easy to get to from Vancouver and beyond! A beautifully scenic 5 hour drive – complete with two spectacular ferry crossings – is all it takes from downtown Vancouver to reach the burgeoning seaside town of Powell River, the staging ground of Desolation Sound. Tour guests can make this travel at a convenient pace the day before they launch into the wilderness, even leaving work on a Friday afternoon in the summer to reach the Upper Sunshine Coast in time for a spectacular coastal sunset. A lot has been said about the warm waters of Desolation Sound, but it honestly cannot be overstated how unique this environment is on the west coast. Tidal streams flowing north through the Strait of Juan de Fuca and south through Johnstone Strait meet in Desolation Sound from both directions, meaning that the Sound does not have large volumes of water coming in and out of the area each day. This means that we do not get strong tidal currents that can be found in other areas inside Vancouver Islands, and that the water has the opportunity to rise to temperatures much higher than anywhere else in British Columbia! Practically, this means that summer in Desolation Sound can see ocean temps reach comfortably over 20 degrees celsius in places! Swimming and snorkelling are favourite pastimes of guests on our tours, especially after a nice, hot summer’s day on the water. Opportunities for education and interpretation abound when you can get right close and personal with intertidal wildlife like we do in Desolation Sound. Snorkelling allows our guests to gain new perspectives on this little encountered oceanic world, and the warm temperatures make the experience unforgettable in more ways than one! 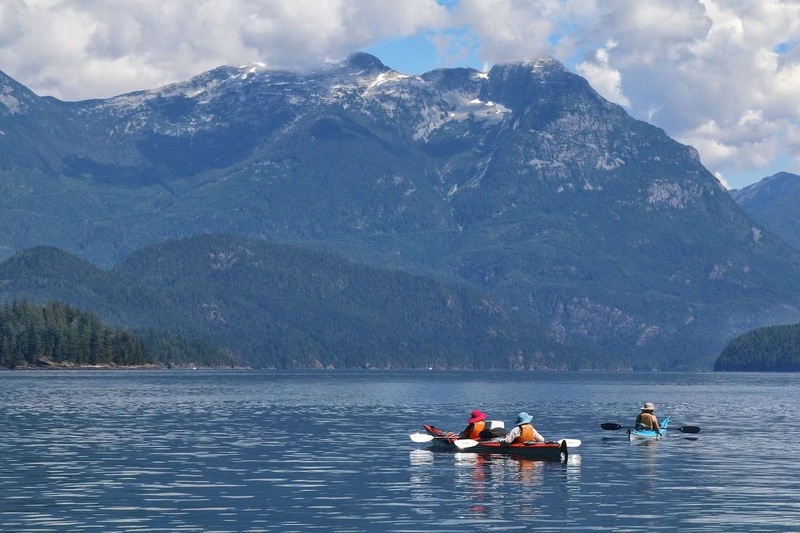 The Coast Mountains frame Desolation Sound to the east like no other paddling Destination in British Columbia. Thousands of years ago, glaciers emerged from the peaks above and carved the steep mountain valleys and cliffs that are synonymous with Desolation Sound. These mountains form an impenetrable barrier that puts any further mainland coastal settlement north of Desolation Sound out of the question, and proved to be the true nemesis of Captain George Vancouver back in 1792 – a wall of ice and rock that disallowed any further exploration of the fabled North-West Passage that he was desperately seeking. Mount Denman is of course the crowning jewel of the mountain-scape, causing guests to let out an exhalation of breath in appreciation as the scene slowly unfolds as they enter Desolation Sound from Malaspina Inlet to the south. Further north these steep mountains are punctuated by long, wide, deep coastal fjords that snack their way into the Coastal Mountain range before ending in wide river estuaries that feed untold numbers of birds and terrestrial wildlife. Toba Inlet is the fjord directly north of Desolation Sound that we visit on some of our expedition tours. Turquoise ocean water meets towering cliffs that rise into immense ice capped mountains thousands of feet above. Ribbons of water cascade – sometimes gently, sometimes with a thunderous roar – from hidden lakes far above, and you can spend a whole day paddling in awe of the grandeur of the scenery without seeing another soul. The grandiose scenery is certainly awe-inspiring, but it’s the small and hidden features of Desolation Sound that make it feel so intimate no matter what time of year you visit. Uninhabited islands and tranquil coves are found round almost every corner and Countless bluffs, ledges and pocket beaches are perfect for pulling up a comfy camp chair and a good book. Hot summer days can bring a craving for a refreshing freshwater dip, and Desolation Sound caters to us here as well. Paddle up to a quiet cove, leave your kayaks above the high tide line, and follow mossy trails beneath towering trees to hidden lakes undetectable from the ocean below. Coastal British Columbia is known as a temperate rainforest, which means that during the cooler, winter months we see a lot of precipitation. Few people know however, that from mid-June to late-July BC actually has the driest weather in all of Canada – and without the muggy, 40-degree temperatures that can be found elsewhere as well! Long, summer days warming to temps in the mid-twenties celsius are the norm out here in July and August, and couples with water temperatures topping 20 degrees you could be forgiven for thinking your are sitting on a nice southern beach if it were not for the preponderance of granite instead of yellow sand. Less clouds also gives way to more epic sunsets, something that Powell River and Desolation Sound is increasingly becoming famous for in the age of social media. Deep reds, oranges and yellows dance slowly across the summer sky, the perfect ending to another spectacularly perfect day in paradise. We’ve always been proud of the wildlife viewing opportunities in Desolation Sound – from colourful intertidal invertebrates to transient orcas to bears and other terrestrial mammals on the forested shores. In recent years however we have certainly noticed an uptick of some very exciting sightings. Most recently, humpback whales have been returning to the waters inside Vancouver Island in huge populations every summer for the first time since they were effectively whaled out in the early 20th century. This suggests not only a greater respect for these magnificent creatures from human populations, but also an abundance of microscopic food sources that these humongous animals consume! Desolation Sound has been home to human inhabitants for over 10 000 years. We acknowledge the traditional stewards of this land – the Sliammon, Klahoose and Homalco – in which we paddle, hike and enjoy so much today. 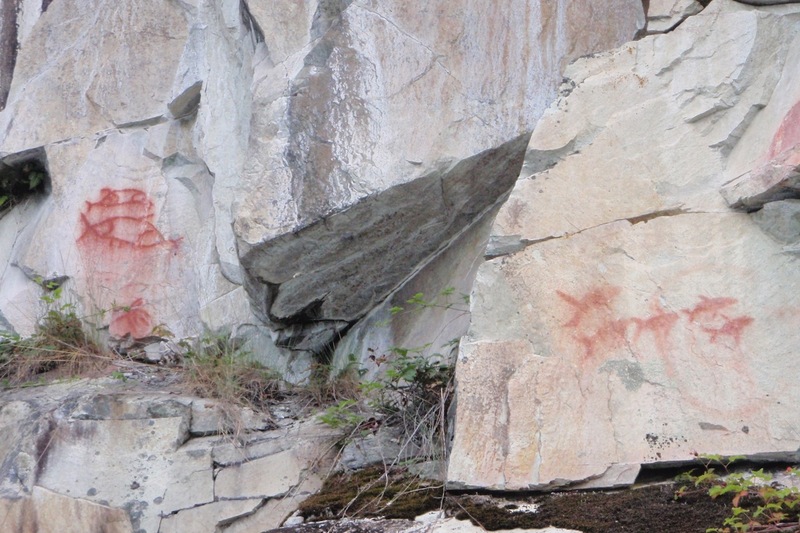 Indeed, there are many illustrations of this cultural and spiritual history past that we can still see and marvel at today – from pictographs in Homfray Channel to clam gardens in Okeover Inlet and shell middens in Prideaux Haven. From this traditional past throughout European settlement to the modern day, Desolation Sound has always had a rich and colourful story to tell, attracting intrepid explorers and unsavoury vagabonds alike throughout the years, hilariously illustrated recently in Grant Lawrence’s bestselling book ‘Adventures in Solitude’. As you can see, there is no shortage of adventure to write home about when discussing Desolation Sound, and after 25 years of exploring we find that there are still more stones to turn as we move into our second quarter century of life in this fascinating and beautiful part of the world. Come join us in 2019 for our 25th season and #experiencedesolation for yourself!